Topics: Nota Bene Baroque, Reviews, Photos, Videos, Shadow Puppet Theatre, & Nbb Aprons. 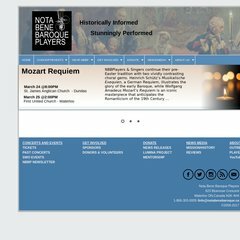 notabenebaroque.ca Concert Season 2012-2013 :: Nota Bene Baroque :: (Waterloo Region ..
On average 14.00 pages are viewed each, by the estimated 47 daily visitors. Its 2 nameservers are ns2.mywwwserver.com, & ns1.mywwwserver.com. 4rweb Inc (New Jersey, Old Bridge) is the location of the Apache/2 server. Its IP Number is 64.118.84.11. PING (64.118.84.11) 56(84) bytes of data. A ping speed test response, is timed at 29.0 ms.